Galina Slavova practice includes tax advice and tax compliance services to foreign businesses and individuals not established for tax purposes in Bulgaria with a focus on VAT law compliance and reporting requirements. In particular, Galina Slavova’s professional experience includes representation of foreign clients before the Bulgarian tax administration in the process of obtaining a registration for VAT purposes in Bulgaria, preparation of monthly VAT returns and Intrastat ledgers, representation before the tax administration in the course of VAT refund proceedings, tax checks and tax audits, as well as support in the day-to-day communication with the tax authorities concerning the client’s business activities in the country. 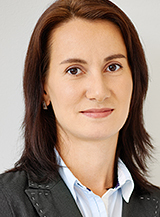 As a part of Delchev and Partners tax practice, Galina Slavova has contributed to the elaboration of a separate service line in provision of VAT agency services to foreign businesses not established in Bulgaria for tax purposes which are required by law to register for Bulgarian VAT purposes through a Bulgarian VAT agent. Provision of VAT compliance services to Europipe GmbH in respect to the companies activates as producer and supplier of welded steel pipes designated for the construction of South Stream Pipeline project. VAT advice, representation in VAT refund procedures and tax audits, monthly VAT compliance and Intrastat reporting services to the leading manufacturer of commercial vehicles MAN Truck & Bus AG. Tax advice regarding Euro 34 million supply under a public procurement contract in Bulgaria for delivery of public transport vehicles by MAN Truck & Bus AG. VAT compliance services and Intrastat reporting obligations for Toshiba Corporation (Japan) as one of the main contractors engaged with the rehabilitation, renovation and reconstruction project of Maritza East 2 Power Plant in Bulgaria. VAT compliance, Intrastat reporting and tax audit assistance to IHI Corporation (Japan) – one of the main suppliers of equipment and installations for the renovation of the desulphurization system of Maritza East 2 Power Plant in Bulgaria. VAT compliance services for Mitsui and Co (Japan) in the course of its works in Bulgaria for implementation of Maritza East 2 Power Plant rehabilitation and reconstruction project. the chemical industry аnd power plants, on all aspects of monthly VAT compliance and tax reporting obligations; representation before tax authorities in tax checks and audits concerning the activities of DSD Hilgers in Bulgaria as one of the subcontractors involved in the construction of Maritsa East I Power Plant. Siemens Enterprise Communications Gmbh & Co (Germany), on tax registration and VAT refund on assets purchased prior to registration; monthly VAT compliance services and general representation in a number of VAT audits and tax checks related to effective recovery of VAT. Advised and supported the employees of Reward Gateway (UK) Ltd. -Bulgarian Branch with the submission of the annual personal income tax returns by personal meetings with the employees, collecting necessary data on the tax status of the individuals, preliminary calculations and assessments, advising on possible tax relieves and final submission of the tax returns. HABAU PPS Pipeline Sytems GmbH on the VAT position of the Romanian company in Bulgaria with regard to the assigned construction of teh main and back-uo pipeline of the Bulgaria – Romania gas connector under teh river danube, including inter alia VAT registration of the company, VAT treatment of the services under the contract with its assignor and subcontractors involved in the project, VAT compliance and Intrastat filing services to HABAU PPS Pipeline Systems Srl in respect of its Bulgarian operations; day-to-day supported with regard to tax inspections and tax audits initiated by the Bulgarian tax administration.